The TA10 is ideal for commercial areas and large residences. Two independent tine rotors with 32 interchangeable closed spoon 1/2 tines provide superior maneuverability around corners and tight areas. Five optional weight containers ensure optimal soil penetration. Tip wheels allow the TA10 to easily pass through narrow openings. 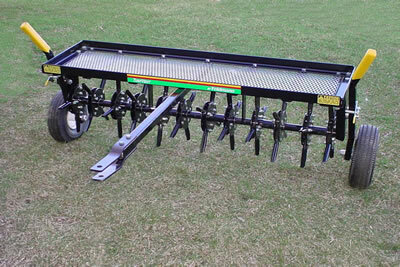 The rugged design of these aerators offers years of low-maintenance productivity. * Please call us for any questions on our plug aerator pull behind rentals in Kokomo IN, Logansport, and Central Indiana.